The Fire Safety Commendation Medal may be presented by the National Society, a state society or a chapter to an individual for accomplishments and/or outstanding contributions in an area of fire safety and service. The award is not limited to firefighters. It may be presented to recognize a variety of fire safety and service that has evolved into a highly technical and skilled profession with constant study, development and involvement by numerous dedicated citizens with a single goal – protect human life and property by preventing injuries or casualties due to fire and chemicals. It may be presented only to an individual and may be only presented once. The medal may also be presented posthumously. The obverse of the medal depicts a fireman’s badge with a flame in the center. The names of all recipients are published annually. 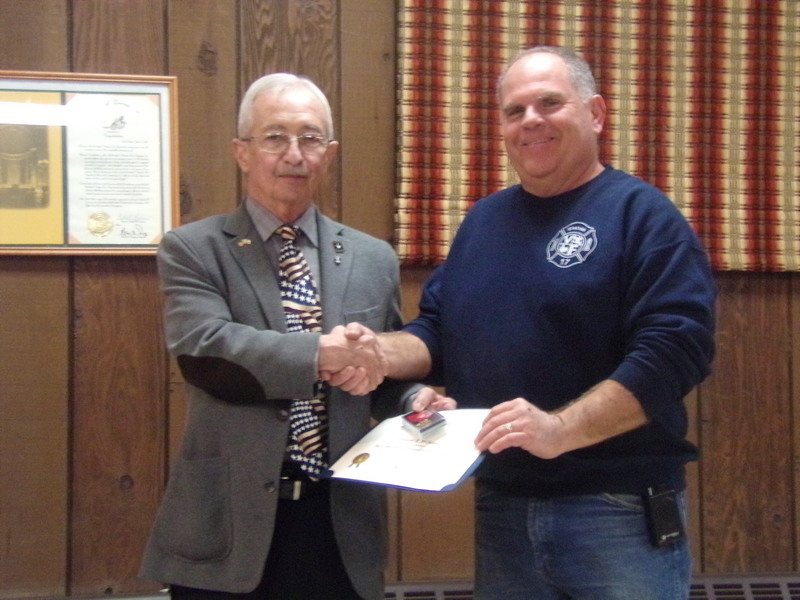 During the meeting of the Stockdale Fire Department on December 19, 2016, President of The George Washington Chapter Larry Ridgway, Sons of The American Revolution, presented Thomas J. Wilkinson with the Fire Safety Commendation Award. This award is presented to an individual for accomplishments and or outstanding contributions in the area of fire safety and service. Chief Wilkinson will celebrate 40 years of service as a volunteer firefighter in 2017. He is Fire Chief of the Stockdale Fire Department and Mayor of Roscoe, Pennsylvania. He is also one of the founders of the RESA Regional Police Department where he currently serves as Chairman.